A team of Colorado School of Mines students won the grand prize at NASA's collegiate deep space competition, beating out 13 other undergraduate and graduate student teams from around the U.S. and the world. Judges at the 2018 Revolutionary Aerospace Systems Concepts - Academic Linkage (RASC-AL) competition awarded Project POSEIDON – short for Polar Sample Extraction In-situ Drilling Operations Network – first place overall, first place in the Undergraduate Division and Best In Theme. POSEIDON proposed a reusable system of lunar rovers equipped with drills to take samples of the regolith, or moon dust, and then return them to NASA's future deep space gateway for analysis back on Earth. Runner up in the competition was the University of Maryland TERPS: Trans-Mars Exploration Reusable Propulsion Stage. The top two teams won a travel stipend to present their research at the 2018 American Institute of Aeronautics and Astronautics (AIAA) Space and Astronautics Forum and Exposition (SPACE Forum) in Orlando, Florida, on Sept. 17. "This is a win for Mines and a win for space resources," said team leader Adam Marcinkowski, a junior majoring in mechanical engineering. "We were going against teams that were dealing with rocketry or orbital mechanics or space habitats – traditional aerospace areas. For a space resources-focused team to win the entire competition affirms the importance of space resources in the future of human exploration of the solar system." "Space is more than just rockets," he said. Teams in the competition could choose from four project categories – reusable hybrid propulsion stage, artificial gravity, propellant resupply capability and lunar polar sample return architecture. Their proposed conceptual missions were judged on their 15-page technical papers, oral presentations and poster presentations. POSEIDON, building on Mines' 20-plus-year history in space resources, selected lunar polar sample return architecture. Their mission's rovers would target the permanently shadowed regions of the moon, where scientists believe there could be as much as 1 billion metric tons of water ice. More specifically, the team chose the Cabeus crater, where a past mission crashed a rocket stage and detected water and hydrates in the resulting plume. That water could be used to make rocket propellant to fuel deep space missions to Mars and beyond. Marcinkowski credited the visual aspect of their presentation for setting them apart from the rest of the competition. Teammate Ben Burckel built 3D animations using Blender, a free and open-source 3D creation suite he has been dabbling in for years. "We had a compelling story, we had a vision, sending humankind back to the moon and invading it with an army of robots," Marcinkowski said. "They could see the transfer vehicle land and deploy the rovers. They could see the rovers deploy their solar arrays and beam energy down into the crater. They could watch the drilling rover go through the whole drilling sequence." Advising POSEIDON was Jamal Rostami, associate professor and Timothy J. Haddon/Alacer Gold Chair in Mining Engineering. Rounding out the team were Stela Cayatte, Jackson Crutcher, Nam Do, Jacob Drozdowicz, Bryce Frazee, John Fuller, Deep Joshi, Sepideh Kianbakht, Sergey Koryakin, Daniela Machnik, Grant McHargue, Kevin Miller, Patrick Ng, Jared Olson, David Shay, Paul Stanton, Nathan Vermeer and Nicholas Wagner. "The Mines students working on the lunar ice core retrieval challenge showed the value of a strong science/engineering background, innovative and out-of-box thinking, progressive planning, being up-to-date with available technology and computer skills in solving very complex and critical problems. They combined these skills with their hard work, good coordination and teamwork, individual commitment to delivering on the work they were assigned to do," Rostami said. "The amazing outcomes were beyond what we had expected, and I commend the team for the achievement." Other schools sending teams to the finals included Georgia Tech, Virginia Tech, Stevens Institute of Technology, Columbia University, Pennsylvania State University, University of Southern California, University of Illinois, University of Minnesota and Drexel University. A second Mines-affiliated team, PORG Station (Planetary Orbiter: a Rotational Gravity Station), competed in the artificial gravity category. Michael Szostak, a senior majoring in mechanical engineering, led the PORG team, which was made up of former NASA Langley interns whom he recruited to take part in the competition. 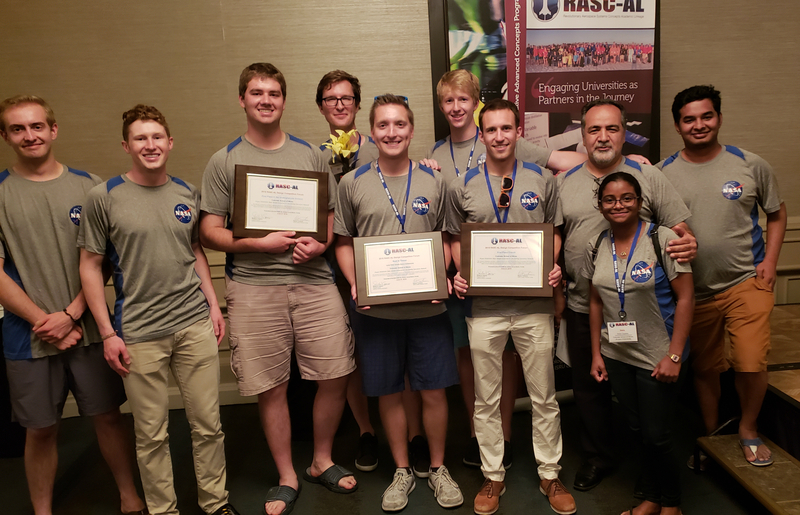 "After many years of participating in the NASA RASC-AL competition, it was very exciting to see our team establish itself as the clear winner in not just one, but several categories," said Angel Abbud-Madrid, director of the Center for Space Resources at Mines. "This multidisciplinary student group presented an extremely well-articulated and complete plan to robotically access soil and ice samples from the lunar poles. This first-prize award goes to show that in both research and academic programs, Mines is undoubtedly a world leader in the space resources field."